The Clipper ship “Orient”, the pioneer of the Orient line of clippers started by James Thompson & Co., was built for the Australian gold rush and was launched at Rotherhithe in December, 1853. However, she was not destined to start life on the Australian run, for she had barely been launched before she was taken over by the Government for the transport of troops to the Crimean War. In September 1854, she carried the 88th Connaught Rangers to the landing at Alma. 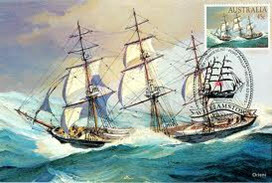 She rode out the Balaclava gale on 14th November, 1854, in which 34 ships were wrecked and more than 1,000 lives lost. 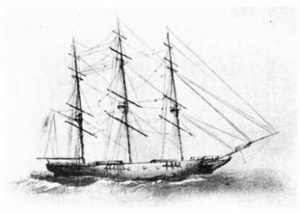 In 1855 she was then made into a hospital ship during the fighting in Odessa, and returned to London in 1856, to begin her work as a passenger ship in the South Australian trade. The “Orient” was a wooden ship 184 feet long and had a 61 foot poop for passenger accommodation. She made 21 voyages between London and Adelaide from 1856-1877, and she generally took about 95 days coming home via the Cape, calling in at Capetown and St. Helena, as was the custom with ships carrying passengers. The voyage starting May 1863 was only one day short of the record at that time. 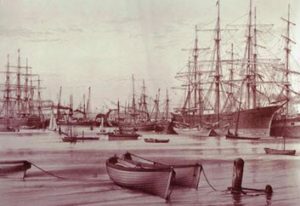 In the late 1850s and 1860s the arrival of the “Orient” was an event in Port Adelaide, and she used to fire guns on arrival. On 3rd November, 1861, the “Orient” left Adelaide with 2600 bales of wool, some copper ore and several passengers. Touching at the Cape she left Table Bay on 18th December. On the morning of 2nd January, smoke was observed to be rising from the fore hatch. Captain Lawrence at once had the lower deck hatches lifted fore and aft, but there was no smoke in the hold, which seemed to prove that the fire was confined to the ‘tween decks’. The hands were turned to breaking out cargo, but were driven from the fore hold after getting to the third beam aft of the hatchway. The mainsail was then hauled up and the fore hatches put on to prevent a current of air. The main hatchway was then opened and an attempt made to break out the cargo from that hatch, but again the crew were driven back. The hatches were next battened down and every aperture closed. The carpenter was then ordered to bore holes in the deck. He started in the galley and gradually worked forward until he was over the seat of the fire. On this being found the fire engine, condensing engine and every other means was brought into use for pouring water below; and as fast as it went down it was sucked up again by the ship’s pumps. The deck ports and scupper holes, also, were closed and the deck itself kept some inches deep in water. Whilst the crew fought the fire, the passengers, under the direction of the bosun, provisioned and lowered the boats and streamed them astern. At 5pm dense smoke began to issue from the scuttle under the fore chains, the woodwork was charred, and the glass bull’s-eye melted. The scuttles were immediately plugged and the deck cut through at this place. The result was startling. Smoke and flames burst out in volumes. All night long the crew kept doggedly at the pumps and fire engine. Next day the women passengers were all transferred to a Dutch ship which stood by the burning “Orient”. At last the fire was smothered and on the 5th January the Orient arrived at Ascension. She was temporarily repaired and then proceeded, and arrived safely in the London river, where the underwriters presented Captain Lawrence with a piece of plate worth £100, and £800 for himself, officers and crew. In the 1860s the first batch of sparrows were transported to Australia but only one survived. Two years later, a second batch arrived and the birds were sold to private collectors. Within a decade the spread of sparrows created panic in rural areas and a bounty was put on their heads and collectors produced 40,000 sparrows heads and 250,000 eggs in a year. But the sparrows were too firmly established and within five years the bounty system was abandoned. 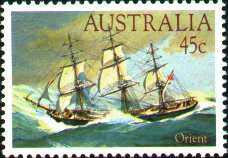 John Henderson was on her eighth voyage to Adelaide and it was the second voyage under Captain Harris. She left Plymouth on 1st May and arrived in Adelaide on 12th July, taking 73 days in all, her fastest time so far. 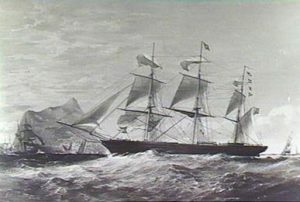 The Orient was sold in 1879 to Cox Bros of Waterford, Ireland and they sailed her between there and Quebec and between Cork, Liverpool and Greenock and the United States and New Brunswick ports. They sold her in 1891. She was then de-masted and converted into a coal hulk in Gibraltar Bay and not broken up until 1925.